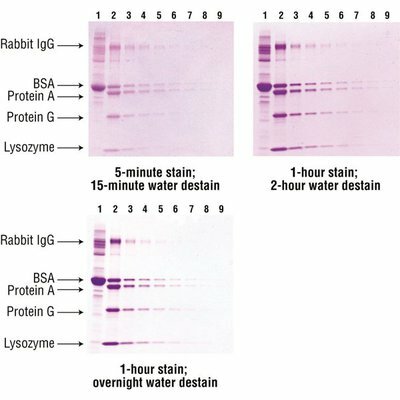 Detect proteins in the low-nanogram range with this ready-to-use, in-gel, colorimetric stain formulated to deliver fast and sensitive SDS-PAGE staining. Imperial Protein Stain is a coomassie dye reagent for detection of protein bands in sodium dodecyl sulfate polyacrylamide gel electrophoresis (SDS-PAGE) and 2D gels. 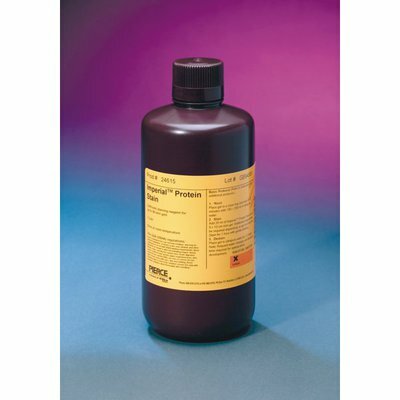 The stain is a unique formulation of coomassie brilliant blue R-250 that delivers substantial improvements in protein-staining performance compared to homemade or other commercial stains. Staining results in intensely colored protein bands that are easy to photograph and document with gel imagers. This reagent is one of the most sensitive colorimetric stains available, easily detecting 3 to 6 nanograms of protein per band. The Imperial Protein Stain protocol uses simple water-wash steps rather than methanol/acetic acid fixation and destaining, which saves valuable preparation time and minimizes reagent costs.